This insightful reference demonstrates a system of measurement, inspection, gaging, geometric tolerancing, and fixturing of products in full compliance with the American National Standards Institute (ANSI), the American Society of Mechanical Engineers (ASME), and the International Organization for Standardization (ISO) approved standards. 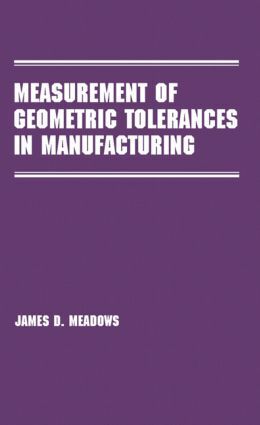 Providing thorough, easy-to-understand explanations of complex principles, Measurement of Geometric Tolerances in Manufacturing shows how to save time and money by anticipating potential problems in functionality, part manufacture, and measurement. The author explains how to design high-quality, low-cost products that are easy to produce and measure; plan a detailed process of data collection during the design phase and collect variables and attribute inspection data; reduce revisions, increase production line efficiency, and enhance product reliability; increase tolerances without adversely affecting function; and move quickly from design concept to part production by bridging communication barriers between job disciplines. Introduction to measurement principles - once upon a time in the land of measurement; geometric product definition and measurement, inspection and gauging principles; reading the feature control frame; functional product definition creates functional inspection; principles of measurements for geometric characteristics; comparison of controls; datums; material conditions (modifiers) meaning and uses; virtual and resultant condition boundaries; gauging - principles, terms and examples; merging theory with reality; how to improve quality; inspection planning; source of measurement error; graphical inspection techniques and examples; teamwork issues; training issues; letters - common problems and their solutions.